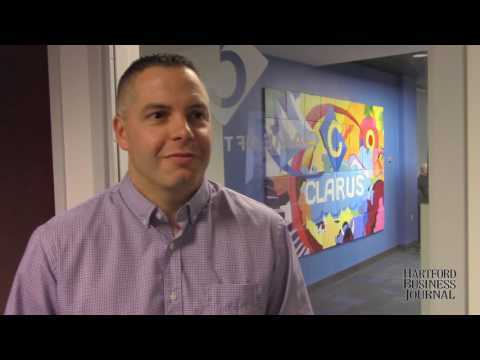 Caporaso's teamwork mantra spurs growth at Clarus Commerce | HartfordBusiness.com . New to the site? Click here to register. Tom Caporaso stands next to artwork created by staff that depicts various employee activities. CEO, Clarus Commerce, Rocky Hill. Highest education: Bachelor's in marketing, Central Connecticut State University, 1994. Tom Caporaso likes what he sees in the new office for Clarus Commerce, the marketing-technology company that includes its flagship brand, FreeShipping.com. The open floor plan and spacious Clarus cafe encourage the kind of employee interaction and collaboration he relishes, feeding a company culture of idea-sharing, transparency and teamwork. Clarus moved in March to the single-level space in Rocky Hill from a two-level office in Middletown. "This is a reflection of the type of environment that we have tried to build over the years — the space has done wonders in six months of just continuing to push the collaboration," Caporaso, CEO, said from the Game of Thrones conference room, one of several named after TV shows. The office, with bag-like chairs against outer walls, reflects the easygoing style of Caporaso, 44. He wants the nearly 80 employees at Clarus to be comfortable, so shorts, sneakers and T-shirts are acceptable, including for him. "I don't manage through fear," he said. "I don't think it's that hard … to be nice to people while we're doing great work and while [employees are] staying challenged." It's a management style influenced, too, by a health scare in 2001, when a hole in Caporaso's heart was discovered, a defect unnoticed since birth. He had open-heart surgery that year, two years after running the Hartford Marathon. "I think what that taught me is sometimes life is short and you should take advantage of the opportunities in front of you, you should have fun while you're doing it, and a lot of that has kind of weaved into … how I work with the team here," he said. Clarus' other brands are Return Saver, FreeShipping.com, Travel Plus, ShopSmarter and DeliveryDeals, the latter a UK product similar to FreeShipping.com. FreeShipping.com was the first product for Clarus, which was founded in 2001 by Vin Villano. "The No. 1 goal of those products is for people that historically shop online: How do we save them money?" Caporaso said. The sites have a subscription component, which earns subscribers savings across the web. FreeShipping.com subscribers, for example, get 10 percent off their purchase with 1,500 retailers — "pretty much everybody out there besides Amazon" — free shipping, free returns and a comparison-shopping engine with 100 million-plus SKUs. Return Saver was developed with FedEx, addressing a market where many retailers charge for return shipping. Return Saver charges an annual $49 fee for unlimited returns with any retailer. Clarus also is using its technology platform for its growing "white-label" business, which Caporaso described this way: "We're like Amazon Prime in a box, meaning, if you are a retailer and you looked at Amazon Prime and said, 'Geez, how do I get a program like that?' we will build that for you." It will be subscription-based, have benefits like shipping, cash back, returns or something else with Clarus building it, powering it, working with the client to acquire customers through their channels and doing all the back-office servicing, he said. Caporaso took Clarus from one product when he arrived in 2009 as president and COO to a suite of offerings today. He became CEO in 2011 when Villano brought in investors from Silicon Valley, then took a small ownership stake in March when new institutional investors bought out the others and Villano. Rhiannon Herrmann, senior vice president of product and operations, lauds Caporaso's management, saying he meets with each employee annually — even as staff has grown by nearly 70 since his arrival seven years ago — soliciting feedback and truly listening. "He actually takes the time to extract from these sessions ideas and suggestions that might make sense to implement," Herrmann said via email. Caporaso, a sports enthusiast who envisioned being an ESPN anchor before a college marketing class changed his mind, played myriad sports as a youth, club volleyball in college and remains fit. "I think growing up playing sports has played into how I manage — I truly believe in the team mentality," he said. He and his wife, Michelle, work as a team at home, too, raising three active children: twin girls, 11, and a son, 9.